Today is the anniversary of what is known as the Tunguska Event. It is named for the Tunguska river in a very remote area of Siberia. On June 30th 1908, it was the site of a massive explosion. The blast destroyed 830 square miles (2,150 sq km) of forest. It is the largest such event in recorded history and, even now, no one can really agree on what caused it. Luckily it was such a sparsely populated area that no fatalities were reported, and hopefully this is because there weren’t any. The explosion is thought to have been caused either by an exploding meteorite or a comet. Leonid Kulik, the first man to investigate the site, expected to find a huge crater in the middle of the area of devastation, but what he found was a clump of trees that were stripped bare but still standing. For miles around the trees had been knocked down in a direction away from the blast. It seems that what ever caused it had exploded in the air, stripping the trees directly below it, with the force radiating outwards when it hit the ground. Some mineral samples taken in the area suggest a meteorite, but it is far from conclusive. The lack of any obvious impact sites and the reports of glowing clouds suggest a comet. The glow could have been caused by fragments of dust and ice from the comet in the upper atmosphere catching the sun’s rays. I did find an eyewitness report that claimed a new lake had been formed in the explosion, and that it boiled for two days. But this seems to have been dismissed. However, there is a lake nearby called Lake Cheko which may or may not have been created by a fragment of meteorite. A team of investigators from the University of Bologna believe they have identified a large rock, deep in the lake which may be a piece of the meteorite. They also have evidence from the sediment in the lake that it may be only a hundred years old, but because the area is far from any centre of population, nobody can be certain how long it’s been there. There are many other explanations on offer. Some suggest that a cloud of natural gas, from under the earth’s crust, may have been forced to the surface and then been ignited by lightening. Others that it was caused by a scientist called Nikola Tesla, who claimed to have invented, and therefore perhaps tested, a weapon that could transmit electricity through the air. Among some of the even crazier theories are a black hole colliding with the earth, an exploding spaceship and a nuclear bomb that somehow travelled back in time and exploded over Siberia. What ever happened, we are incredibly lucky that it did not explode over a major city. St Petersburg, Helsinki, Stockholm and Oslo are all on the same latitude, and could easily have been in the path of a comet, meteorite, spaceship or time-travelling bomb. Yesterday, I wrote about Peter the Great and his efforts to drag his country out of its dark medieval past and into renaissance Europe. Today, I am still in Russia, with the story of another Tsar that illustrates just how dark and wild that past was. On this day in 1605, seventy-seven years before Peter was born, a person, who became known as False Dmitry I, arrived in Moscow and was made Tsar. The story of False Dmitry isn’t exactly uplifting, but it is a good one. It reads like a bit like a Grimm’s fairytale but without the upbeat ending. To explain what happened, I need to go back a bit and begin with Ivan the Terrible. Ivan had a son, also called Ivan, who was heir to his throne. But, in 1581, they fell out and the Tsar accidentally killed his son by hitting him over the head with his sceptre. When Tsar Ivan died in 1584, he was survived by two sons, Feodor and Dmitry. Feodor, the elder of the two, was made Tsar but wasn’t really cut out for the job. He is described variously as very religious or a bit simple. Whatever it was, the real power behind the throne lay with his father-in-law Boris Godunov. He had Dmitry and his mother sent into exile. It is possible that Godunov saw young Dmitry as a threat to his power but Dmitry wasn’t really in line for the throne. The Russian Orthodox church only allowed three marriages and Ivan had been married either seven or eight times. I wish I could tell you that his ex-wives lived long and happy lives, free from a husband whose second name was ‘the Terrible’, but, for the most part, they didn’t. Dmitry was the son of his last wife and would have been considered illegitimate. Then, in 1591, there was a terrible tragedy, or murder, we don’t know which. Nine-year-old Dmitry was somehow stabbed in the throat and died. According to his mother, Godunov had him killed. According to Gudunov, the boy stabbed himself, after suffering an epileptic seizure whilst playing with a knife. But there was a third possibility, that Godunov’s assassins got hold of the wrong person and Dmitry escaped. In 1598 Feodor died, childless, and Boris began to rule in his own right. Things went pretty well for Boris at first but, in 1601, there was a terrible drought and all the crops failed. This was followed by the drought of 1602 and in 1603, unfortunately, a drought. It was a terrible time for the Russian people, around a third of the population starved to death and those who survived were feeling pretty unhappy. Boris died in 1605 and was succeeded by his son who was also, confusingly, called Feodor. Meanwhile, a man claiming to be Dmitry turned up in Poland. He claimed that he had not died at all but had been spirited away and sent to a monastery. He gathered an army, killed the remaining Godunovs and took the throne. His mother recognised him immediately as her long lost son. But we must take into account that she had been stuck in a convent for years, so a new life as mother of the Tsar must have been quite appealing. The reign of False Dmitry I was pretty short, less than a year. He married a Polish woman called Marina Mniszech who failed to convert to the Russian Orthodox religion. Rumours spread that he was about to form an alliance with Poland, which was not a good thing, and, even worse, that he planned to reunite the Orthodox Church with the Catholic faith. Then another rumour grew, probably fuelled by the Russian Orthodox Church, that Dmitry was about to gather together all his Polish friends, lock the gates of the city of Moscow and slay every Russian inside. That obviously fuelled a lot of unrest and, on 17 May 1606, loads of people stormed the Kremlin. The Tsar tried to escape by leaping from a window. The painting above illustrates the last moments of his life. He is the one in yellow. Dmitry, or whoever he really was, broke his leg in the fall and was killed by his enemies. His body was put on display before being burnt. Then his ashes were then put into a cannon and fired towards the Polish border. His wife escaped and returned to her home country. If you’re wondering why he is called False Dmitry I, it’s because at least another two False Dmitrys appeared after that. False Dmitry II was also found in Poland, in 1607. Interestingly by the Father-in Law of False Dmitry I. When he introduced this Dmitry to his daughter, she immediately recognised her lost husband. And why wouldn’t she? False Dmitry II was killed in 1610. But then, in 1611, yet another death-cheating Dmitry popped up. If this was a fairytale, the third Dmitry would have turned out to be the real one and everyone would have lived happily ever after. But it isn’t and False Dmitry III was executed in 1612. The period of history between the death of Ivan the Terrible and the establishment of the Romanov dynasty in 1613 is referred to as ‘the Time of Troubles’. Posted on June 10, 2016 June 8, 2016 Categories brilliant russiaTags boris godunov, false dmitry, ivan the terrible, russia, time of troublesLeave a comment on True or False? Today is the the birthday of Peter the Great, who was born on this day in 1672. I’ve mentioned Peter a few times already when I wrote about about the Dutch artist Maria Sibylla Merian, Frederic Ruysch and the Alaska Purchase. His official title is so ridiculously long that I’m not even going to tell you what it was. So I’ll just stick with ‘Emperor of all the Russias’. But what would you think if I told you that the Emperor of all the Russias spent eighteen months of his reign travelling around Europe in disguise working in dockyards? Well, I am going to tell you that, in a minute. Peter inherited the throne from his half brother and, from the age of ten, shared the title of Tsar with another step brother. But the real power behind the throne, literally, was his older step sister. There was a hole cut in the back of their double throne and she used to sit behind it and tell them what to say. She later tried to overthrow both of them and got sent to a convent. Then, in 1696, his brother died and Peter became sole ruler. Like anyone who goes about calling themselves ‘the Great’ he wasn’t an entirely good person. He once personally beheaded two hundred people with an axe. But let’s not focus on that. He seems to have spent most of his reign either trying to start a war or fighting one. His problem was, that although Russia was a vast country, full of all sorts of resources that people might want to buy, exporting them was difficult. What Peter really wanted were ships, he really liked ships, and the only place he could have ships was the port of Arkhangelsk on the northern coast. That wasn’t ideal, because it was ice bound for a large part of the year. What he needed was either a bit of Sweden or to overthrow the Ottoman Empire so he could have access to the Black Sea and the Caspian Sea. So he thought it might be a good idea to start some wars. But he would need allies. In 1697, Peter organised his ‘Grand Embassy’ which was an entourage of around two hundred and fifty people, including himself. They set off on an eighteen month journey around Europe looking for support for his plan. 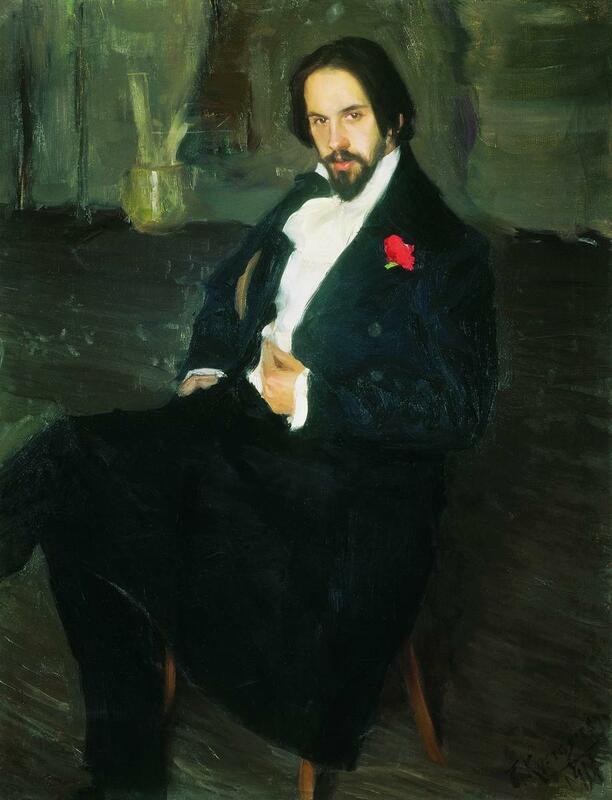 The Tsar was travelling incognito, calling himself Peter Mikhailov. But I don’t imagine his disguise fooled many people as Peter was unusually tall at 6′ 7”. They didn’t have much luck. People were far too worried about who was going to be the next King of Spain after the unfortunate Charles II, who wasn’t very well at all. It wasn’t a wasted journey though, because Peter got to see Europe. Russia was, at that time, still stuck in the Middle Ages. The Renaissance had passed it by. Peter was the first Russian ruler to leave his country in a hundred years and he was impressed by what he saw. When I try to imagine what that would have been like for him, I think about how I would have felt if someone had given me the internet in 1973. Peter loved two things, well, three things, but we’ll get to that. He loved ships and he loved the ‘cabinets of curiosity’ that wealthy people had begun to collect. When he visited the Netherlands, which was a massively important sea-faring nation, he managed to get hands on experience on how ships were built He also recruited skilled workers, who would be able to help him with his plans for a Russian Navy. But it was also in the Netherlands that he got to see how Europeans really lived. In Amsterdam, he met Jacob de Wilde who had a huge collection of books, statues and scientific instruments. Peter was fascinated. Jacob’s daughter made this engraving in commemoration of their meeting. There, he met Jan van der Heyden, who invented the fire hose. That might not sound very significant, but Peter’s capital, Moscow, was a wooden city and fires were quite a problem. He also met one of my favourite Dutch anatomists, Frederik Ruysch, who taught him how to catch butterflies and how to pull teeth. On a second, later, visit, he bought up Ruysch’s entire, extremely odd, collection and shipped it back to Russia. During his stay in London, he also met with Edmund Halley, of comet fame, who probably helped a bit with the wrecking of Evelyn’s house, so there’s a side of him we haven’t seen. While in England, Peter also visited Manchester. I couldn’t find out what he did there, other than learn how proper cities were built. Despite his behaviour, Peter left England with the gift of a ship and an honorary doctorate from the University of Oxford, in Law, of all things. Peter had to cut his visit short because of a threatened uprising back in Russia. On his way, he managed to forge an alliance against Sweden with the King of Poland, who was called Augustus the Strong. The rebellion was over by the time he got back, but he set about modernising his country. He outlawed arranged marriages amongst the nobility. He made them wear wigs and European clothes. If he caught them wearing coats with long sleeves, he cut them off with a pair of scissors. He also tried to make them shave off their long beards. Anyone who wanted to keep their beards had to pay a ‘beard tax’ and keep a token with them to prove that they’d paid it. On one side it said ‘the beard tax has been taken’, on the other, ‘the beard is a superfluous burden’. He also changed the calender in 1699. The Russians had an odd calender, based on the Byzantine one. They reckoned the year from the supposed date of creation. So for them, it was the year 7207. He also changed the date of New Year from September 1st to January 1st, something we didn’t do in England until 1752. So December 31st 7207 was followed by January 1st 1700. It was a big change for everyone. Peter had taken up the practice of smoking and when people saw him with smoke coming out of his mouth, some thought their Tsar had been captured and replaced by the Devil. Maybe, we’ll leave Peter there. Just before he picks up that axe and starts swinging it. And before he starts forcing everyone to build him a big city in the middle of nowhere. Except, I have one more wild story to tell you. In 1701, while visiting his friend Augustus the Strong, they went on a three day drinking binge which ended with a cannon-shooting competition. Augustus won. Goodness, March is turning out to be quite the month for space travel. On this day in 1961,the Russians launched their spacecraft Sputnik 9. At the beginning of the 1960s, there was a huge race between Russia and the United States to be the first nation to launch a human into space. Everyone needed to learn a lot about space flight; what it would do to a human body, how to make a successful landing, and they needed to learn it quickly. Sputnik 9 was not a manned space flight, but it was an important and interesting step along the way. On March 9th 1961, a dummy was launched into space. He was named Ivan Ivanovich which is the Russian equivalent of ‘John Doe’ or ‘Joe Bloggs’. People who were working in the space programmes were worried about the effects of the lack of gravity on the human body, about the presence of radiation and also that a human confined in a tiny capsule so far away from earth would succumb to what they called ‘space madness’. As much as they wanted to send a person into space, they wanted that person to come back safe and well. The Russians tested and retested their equipment and their final test was to send something as human as possible in an orbit around the earth. Ivan was made mostly from metal with bendable joints because they needed to dress him in a space suit. He had a skin of synthetic leather and a detachable head. His head, they decided to make as lifelike as possible. He had eyes and eye brows, even eyelashes. Then they thought about what might happen if he crash landed in a remote area. Someone might think he was a real human, even an alien. So they taped a big label over his face with the word ‘maket’ which means mock-up. To make sure that space travel was as safe as possible for organic life, Ivan had companions. Because space was at a premium inside the capsule, they used cavities inside his body to carry forty white mice, forty black mice, some guinea pigs, various reptiles, human blood cells, human cancer cells, yeast and bacteria. In addition to this, they sent a dog with him called Chernushka, which means ‘Blackie’. Apart from testing how all these life forms would fare, the safety of the capsule and of the space suit, they also needed to test the ejector seat mechanism that would be used on landing. Sputnik 9, could not land safely, so the pilot would need to be ejected, along with a parachute before the capsule reached the ground. Ivan could also carry, within his body, instruments that measured things like acceleration and radiation levels but they also needed to test communication between the capsule and the ground. For this, Ivan would need a voice. They knew that their transmissions would be picked up by western countries, so they had to think carefully about what Ivan would say. If it sounded like a coded message, people might think they had secretly launched a human into space and that they were being spied upon. Perhaps, they thought, a tape of someone singing a song. This was rejected because anyone who intercepted the transmission might think they had sent up a cosmonaut who had succumbed to space madness. Their solution was simple and rather beautiful. They fitted Ivan with a tape that would play a whole choir singing. There was no way anyone would think that they had sent a whole choir into space inside one tiny capsule. So, Ivan Ivanovich was first launched into space on March 9th 1961. Sputnik 9 made a single orbit of the Earth in a journey that lasted a little over an hour and a half. The mission was a success, the ejector seat and parachute worked and the dummy was recovered. You’ll be happy to know that Chernushka, the dog, who crash-landed along with the craft also survived. A second trial was made on March 25th. This time Ivan was accompanied by a dog called Zvezdochka which means ‘little star’. The dog was given this name by Yuri Gagarin who would, less than three weeks later, become the first human in space. This time, they added to the choir recording, a recipe for cabbage soup, either to make the message even more confusing, or because they thought the world needed to know how to make it properly. This flight was also a success and Zvezdochka also survived her trip. This time the recovery team were unable to get to the landing site, in the Ural mountains, for twenty four hours. The local people, who had watched a figure floating down in a parachute, arms and legs flailing, were very surprised when they approached the lifeless figure and opened his helmet, only to see the word ‘maket’ taped across his face. 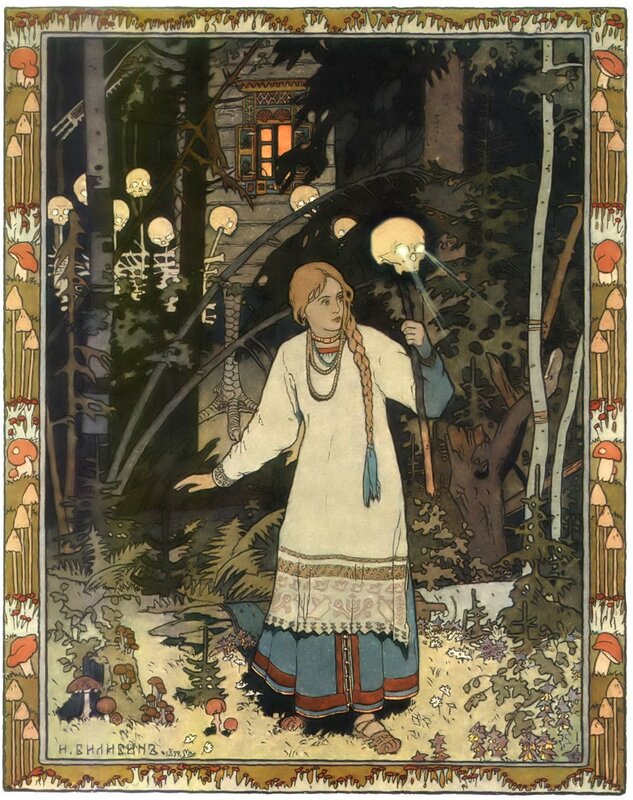 Today is the birthday of Ivan Bilibin who was born in a suburb of St. Petersburg, Russia in 1876. He was an illustrator and theatre designer. I have to admit it, I hadn’t heard of him. It was really his name that drew my attention, but then I looked at his work. I haven’t been able to find out much about the details of his life but his drawings are beautiful. They make me want to stop writing this blog and pick up a pencil instead. I know that he was very influenced by Russian Folk Tales. He illustrated a book of them which was published in 1899. The drawing of the girl with the skull lantern is from that book. The story is called Wassilissa the Beautiful. It starts out a bit like Cinderella, then it gets weird. You can read it for yourself here. Between 1902 and 1904 he travelled around northern Russia for the Ethnography Department of the Russian Museum. There he collected folk art and took photographs of old wooden buildings. He published a book about his findings called Folk Arts of the Russian North. The picture below is from the title page, He has designed the typeface too. I do like hand drawn letterin g and these are lovely. 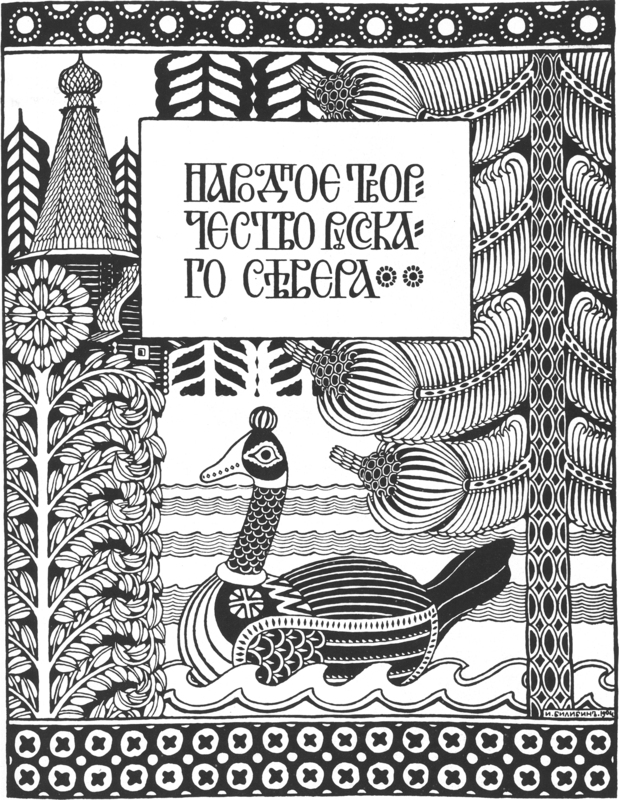 Ivan drew a lot of inspiration from the patterns he found in Russian Folk Art. He loved the images he found in embroidery, printed fabrics and old illuminated manuscripts called lubki. He was also influenced by Japanese woodblock prints and Art Nouveau. 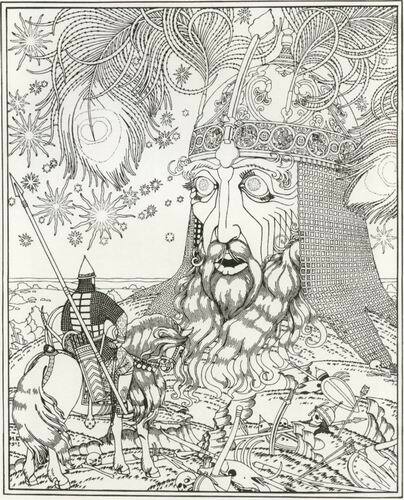 He clearly loved pattern, you can see it in the ornate borders of many of his illustrations. After the Russian Revolution he lived in Cairo for a while and then in Paris. While abroad he painted a lot of murals for Russian Orthodox churches and for private individuals. He returned to Russia after painting the Soviet Embassy in Paris in 1936. Ivan taught at the Russian Academy of Arts whilst also working as a book and theatre designer. He produced designs for Pushkin, Mussorgsky and Rimsky-Korsakov. Sergei Eisenstien wanted him to work on his film Ivan the Terrible but sadly, Ivan died during the siege of Leningrad in 1942.